Most of the time, I prefer to be eating something simple for breakfast such as breakfast potatoes, pancakes, or a bowl of oats. But there are times when I simply want something special. During these times, and when I have the motivation, I make eggs benedict. It's not the simplest breakfast to make, but it's worth making them once in awhile. 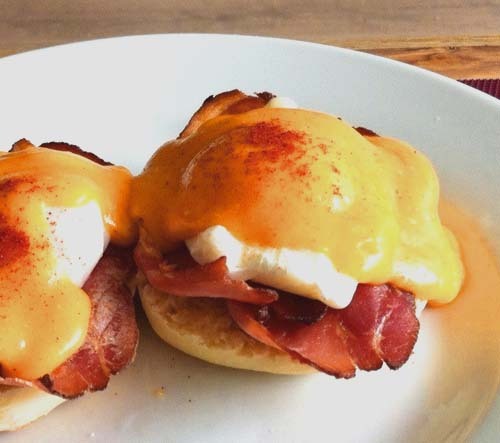 The main ingredients are English muffins, bacon, poached egg, and Hollandaise sauce. The muffins are simple enough; buy them or make from scratch. Bacon can be cooked any you prefer. Frying or baking are the most popular. Poached eggs were sorta difficult because I used to make them from saucepan. But for years now, I've been using an egg poacher that you can buy from Wal Mart, Amazon, and other similar places. So much easier. Now for the part that takes the most time, but it's really not that difficult, the Hollandaise sauce. Melt the butter in a bowl. Set aside. In a separate bowl, whisk the egg yolks while adding a little bit of butter at a time. Continue whisking until all butter are used up. The mixture should be smooth. Add lemon juice, salt, pepper, and cayenne and mix to taste. You may have to warm the finished Hollandaise sauce in the microwave before completing and serving the eggs benedict. The recipe above is more or less for a classic eggs benedict. This distinction is important because I live with a diabetic aunt and she can't eat this. For people with diabetes like her, there are substitutes for the fat- and cholesterol-rich Hollandaise sauce. This website suggests using a mixture of light sour cream, fat free milk and mustard. They're also substituting low sodium ham instead of bacon. Should be something to try in the future.